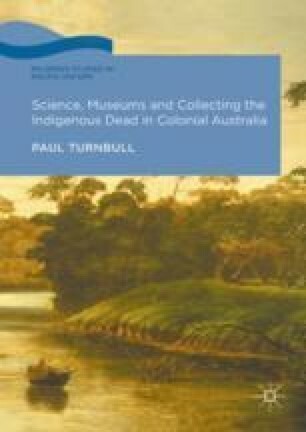 This chapter explores the meanings and values that Indigenous Australian skulls and skeletons acquired when they came into the hands of leading European anatomists of the late eighteenth and early years of the nineteenth century. Particular attention is given to how Australian cranial morphology was interpreted by two of the most influential comparative anatomists of the time: John Hunter and Johann Friedrich Blumenbach. As the chapter shows, both men believed that the bodily form of Australians and other indigenous peoples strikingly demonstrated the susceptibility of humankind to environmentally induced ‘degeneration’ from one original ancestral form into distinctive, geographically peculiar varietal types. The two anatomists similarly believed that this degenerative branching was the result of agonistic struggle between an immaterial vital force sustaining life and environment forces, causing noticeable but biologically trivial modifications of the form of bone and soft tissue structures. The chapter also documents how European anatomists first obtained Indigenous Australian bodily remains, disclosing how they were assisted in acquiring them by Sir Joseph Banks (1743–1820), Britain’s most influential patron of science in the late eighteenth and early years of the nineteenth century. Attention is also drawn to these remains having been obtained on a number of occasions in circumstances reflective of the violence that quickly characterised relations between British colonists and the continent’s first peoples.